Why Are So Many Relationships Failing? Single adults of religious inclination often turn to their spiritual community, hoping to meet a like-minded partner. Houses of worship also provide an environment of spiritual support that can nourish a new relationship. And married people, even those in the most solid of unions, encounter serious obstacles that cause them to look for guidance and spiritual sustenance from their church group. Billy Burnette experienced four marriages and eight years in federal prison as he stumbled along the path toward spiritual understanding that ultimately changed his life. 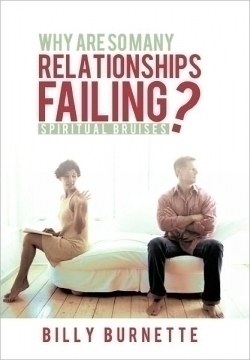 He writes about these troubled years in Why Are So Many Relationships Failing? Unusual events and people help him while in prison and as he reorients himself to the outside world. A strict interpreter of the Bible, he includes amplified quotes and paraphrased excerpts from scripture throughout the text to support his Christian tenets. Predictive dreams, premonitions, and conversations with God give him the confidence to move forward in search of a more satisfactory life. The book concludes with Bible studies and prayers intended to assist readers in their personal searches for faith. Now in his late sixties and successfully married for sixteen years, Burnette grew up in northern Florida in a Methodist family. A certified public accountant, he has worked as a stockbroker and building contractor. Burnette expresses his religious convictions and ideas about building more successful relationships with sincerity. However, the book lacks organization, with the narration jumping from one episode of his tumultuous life to another and subject matter straying from the title’s stated intent. Clip art inserts on nearly every page contribute minimally to illuminating the text. Convoluted sentences and typographical errors further detract from the book’s readability. Those who follow a faith similar to Burnette’s will benefit from reading this personal account of religious salvation. People of other spiritual persuasions may take exception to his prescribed interpretation of the Bible and Christianity.